Title: "Military intelligence during the Cold War, Vietnam"
Roger Corbin and several other soldiers were shot at during the Vietnam conflict Tet Offensive. By the grace of God and an innovative warrant officer, he’s alive today to tell his story. Corbin is among the few servicemen or women to have dual service — first in the U.S. Air Force, and then in the U.S. Army to complete his career. He’s also among an elite cadre of military officials who had “eyes only” clearance during the Cold War as an expert on Soviet Union military targets. Corbin, now the city planner for Sunrise Beach, has a storied career in the military especially considering he graduated from the University of Nebraska-Omaha with a degree in geology. He had the foresight to join ROTC (Reserve Officer Training Corps) while at UNO and completed undergraduate pilot training in hopes of becoming a pilot. Corbin entered the Air Force and began pilot training at Williams AFB in Mesa, Ariz. But his hopes of becoming a pilot were dashed when he and his flight instructors discovered he could not meet the G-force stress tests. Looking back, there was a silver lining as most of his compatriots in pilot training were killed during the war. So, his military career took a different path when his superiors offered him a six-month stint in intelligence school at Lowry AFB in Denver. He was immediately shipped to Strategic Air Command at Offutt AFB in Omaha where he entered the military reconnaissance. There were a lot of rumors going around within the ranks as the Cold War between the United States and the Soviet Union escalated. There were numerous tales of one-upmanship between the two super powers, and whispers of “spook shops” that were run by the more clandestine arms of the military. And Corbin was being cleared for top-secret projects. Without revealing too much, Corbin said his job was to target Soviet Union military locations in case of a nuclear war. As an expert on Russia, Corbin helped build B52 bomber-targeting charts that would be used in a nuclear confrontation with the Soviets. He shuttled between Offutt and a super secret location in the Washington Navy Yard called Building 213. That location, which was a hub for the CIA, has since been declassified and is being demolished. Two of Corbin’s mentors also worked with CIA operative Gary Powers, whose U-2 spy plane was shot down over Russia. The U.S. military build-up in Vietnam was taking place about the same time as Corbin was deep into the spy business with the Soviet Union. Although he was reluctant to go to the besieged country because of what he had learned as a top-level reconnaissance expert, the government sent him anyhow. 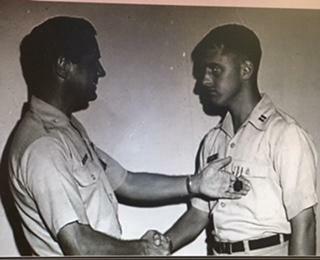 He arrived as a captain in the 7th Air Force and immediately began using his intelligence skills to locate North Vietnamese military targets and develop missions accordingly. The mission was called Rolling Thunder, and the intent was to take to war to the North Vietnamese 24 hours a day “and we did that,” Corbin recalled. There was a sense among military officials that the North Vietnamese were considering some type of major offensive, but no one could pinpoint anything specific. “I was in country about six months before all hell broke loose,” Corbin said. The Tet Offensive hit at 2 a.m. Jan. 31, 1968, and Corbin was sound asleep in the center of Saigon, South Vietnam. His apartment was on one of the major arteries the North Vietnamese would later use in their attack on the South Vietnamese capital. The battle raged. Corbin grabbed his pistol and along with other soldiers took cover. The road between his barracks and the AFB was a hotbed of fighting, but he and the others knew they had to get to the base or be killed or captured. The North Vietnamese were on one side of the road, and the South Vietnamese and Americans on the other in the midst of a firefight. The soldiers were able to radio for help and a U.S. gunship flew down the corridor “hosing the Viet Cong down” and temporarily keeping them out of the compound. Their safety was far from secure, however. A warrant officer and MP sergeant in Corbin’s compound had a lot of war experience from the Korean War. They hatched a plan to load the handful of their group into a jeep and race down the street toward the base as fast as possible. The theory was that before the Viet Cong realized there were Americans in the jeep they would be far enough away to be safe. The plan worked. Although Corbin and the others heard the sickening sound of bullets hitting their vehicle, no one was hurt. They arrived safely. Corbin says a combat force was sent back to the barracks from the Air Force Base and successfully rescued the remaining 40 soldiers. He was honorably discharged from the Air Force in 1973 after having fulfilled his military commitment. But that was only temporary. In 1986, after 13 years as a city planner and college teacher, the U.S. Army called. Officials were well aware of Corbin’s skill set and asked him to share his skills, his knowledge and expertise with Army majors and other high-ranking officials. He closed out his career teaching to captains and majors 10 years later. He was discharged from the Army in 2001 as a lieutenant colonel, the last two years with his own command back at Offutt AFB in Omaha. Two months after 9-11, he closed out his military career. After being a city planner in three Midwest communities and a regional planner for two Councils of Government, he moved to Osage Beach in 2004. In 2007, as word spread of his community planning expertise, he was hired as the Sunrise Beach city planner. As he reflects on his military career, he says God must have been looking after him. His takeaway from it all? “I truly believe that we have go give back, to give back to our communities and others, that while we’re on this Earth we have to do that. If we don’t, then life is meaningless,” he said.